If you’ve been buried in your work like most busy project managers you may not stay up to date with all things activeCollab — so you may not have seen or heard about the Next version that’s been leaked out via a Teaser Video from the activeCollab team. If not, you can see it here. But even more important than the teaser, is the opportunity to let your voice be heard regarding their newest version. 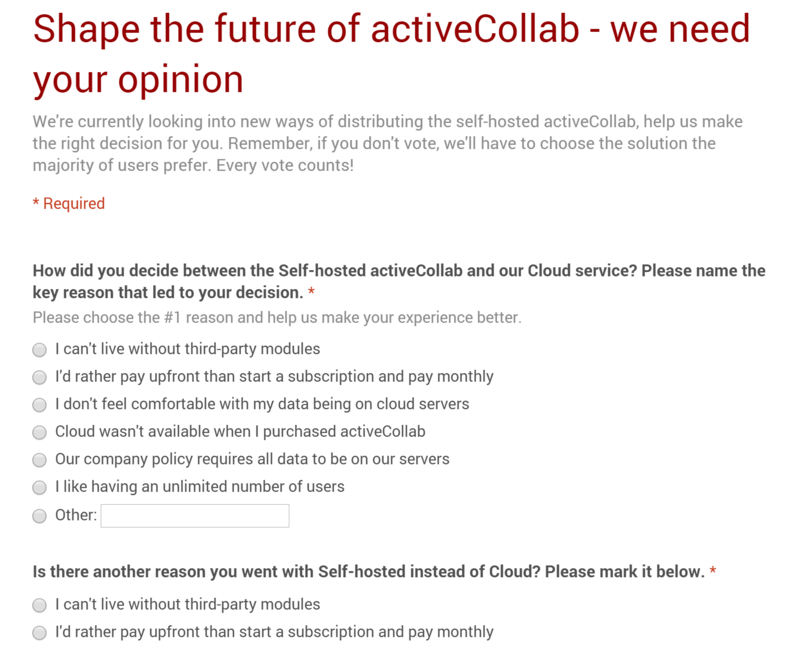 If you haven’t seen this yet, activeCollab has sent out a recent survey to get feedback from customers on the future of the Self-Hosted edition. For those using the Self-hosted version, it’s especially important as it will give the activeCollab team direct feedback on what influenced you to choose the self-hosted solution to be sure your needs are being considered. Go ahead — Take the survey now, I can wait :). Or, read on for more thoughts on the next version. We’re all excited about this new version. We’ve always been early adopters ourselves, as are many of you. But, as you can imagine for us as 3rd party developers who build on top of another platform — there’s always an uneasy feeling that comes along with the excitement of a new major release. There’s much anticipation as we all wait to see what’s changed so we can begin the potentially labor intensive process to update our modules. Of course, we want to get our hands on the new version to try it out! But we also want to be sure we can continue to solve those problems you came to us to solve — so you can continue to manage your projects smoothly without interruption. So much has changed in the activeCollab landscape over the years, especially in the last one – with the introduction of the AC Cloud to support those who wanted an easy out of the box solution without having to setup their own hosting . As easy as it can be to setup AC, it’s still intimidating for some users, so it’s nice they have this platform to get started. By the way, hosting activeCollab isn’t as hard as some make it look— you may be surprised to learn that we host our own activeCollab for less than $10 per month. If you need help with this, definitely reach out. When it comes to Self-Hosting vs Cloud, for some users as many of you already know, the self-hosted version is the only option. There are some key benefits of activeCollab that are only available in the Self-hosted edition…. This is especially important for those needing all out custom solutions like the ones we’ve built for Enterprises, Hotel Groups, Restaurants, Startups, Universities and more. The self-hosted solution was activeCollab’s origin — In my opinion, their key differentiator in many ways as very few solutions allowed for customization or even the availability of downloadable add-on modules. It’s without a doubt the reason why we started using it in the beginning ourselves — many years before we became ActiveLabs to help others be more productive with it. I bet it’s part of your story too — after all, you are receiving this email or reading this blog post because somewhere along the way you were looking for modules, custom development help or consulting assistance from us. And we’re very thankful to activeCollab and the A51 team for making such a flexible self-hosted solution for our own needs and also for the community that’s grown around the app. Not to mention the business, we’ve been able to build dedicated to helping others in this community. What’s great, is that even with the addition of the AC Cloud — activeCollab has acknowledged the continued need for the self-hosted edition, and that’s amazing to see. With the growth of the cloud, I’m sure there could be the temptation to leave the self-hosted version behind for greener SAAS pastures, but I respect that they are recognizing their roots and making a renewed commitment to the self-hosted users that helped them get to where they are today. It says a lot. What’s Coming Up in the Next Version? Now here’s where you come in. There’s a big part you can play in the Next edition — call it activeCollab 5 or activeCollab Next — we’re not sure. And unfortunately, the answer is – We don’t know — because we don’t know how much the codebase has changed. But even more unsure is the state of customization altogether. Why do I say this? Because it seems this question is a high priority on the survey —- that’s where we need your help. As a power activeCollab user, you may be relying on many 3rd party modules from our colleagues in this space like AppsMagnet, UsWebstyle, ZingDev, Triotech, ActiveCollabMod and others, not to mention our own modules or any customization since it’s all done with modules. I know WE do, along with many of our consulting clients. We even have some modules you’ve never seen before that haven’t been released because of the unsure nature of the activeCollab marketplace over the last while. I know my other colleagues in the space have probably felt very similar over the last few years. They are mostly maintaining modules rather than investing in new solutions because the ecosystem of the community is a difficult one with an ever changing landscape and less and less exposure available to new customers with the focus on the Cloud and the removal of the Downloads area from their new website, along with the recent announcement that the public forums on the site will soon be discontinued. And for those of you who use them, you know that they can make a big difference in the day to day operation when you find one that fits your workflow needs. I’m not asking you to help us by manipulating your survey answers, we just want to be sure your voice is heard! — You owe it to yourself to know that your vote is in for what is important to you. Take the survey, because it matters to you and those like you who rely on the flexibility of the self-hosted version with custom solutions and 3rd party modules…My concern is that, those who invest in these improvements are often busy improving their business and not always the ones who have the time or interest in filling out surveys. What if Add-ons and Modules didn’t exist? I understand, we are all busy and doing another survey isn’t exactly at the top of our list, but please don’t miss the importance of this. If modules don’t exist, activeCollab becomes like every other web-based project management system – you rely on the development team to know what’s best for you. And if that happens, those of us who rely on customization to make our workflows actually WORK will be back to work arounds and external api solutions that mean going outside the system for a solution. Many of our customers came from other tools like Basecamp that aren’t customizable and they ended up stuck doing workarounds and were tired of it. I want what’s best for activeCollab and for all those using it — sure we wouldn’t be here today as ActiveLabs if they didn’t support 3rd party modules so you may think I’m biased. But I’m more biased by the day-to-day interactions with customers like you, who use our products and many of the other 3rd party modules to work smarter by smoothing out their workflows. And by those that have relied on the flexibility of custom developed modules whether created internally or with our help to go beyond the One Size Fits All solutions out there and really support their specific workflows. To all those who like to keep their options open, you know who you are — cast your vote for the benefit of all activeCollab users. We hope activeCollab will continue to maintain support for 3rd party modules and custom development — and even continue to expand the API to allow us to do more within the framework to help you to collaborate! Thanks for taking the time to read this today and if you have your own thoughts and concerns about activecollab Next/ 5.x please share any comments or questions below or contact us privately. And again if you haven’t filled out the survey yet, please take a couple minutes to do that now. WordPress would not be the worlds most popular CMS without the self-hosted version. AC is great software but we will move to another app if they stop supporting the self-hosted version. Im the same – If Active Collab is only in the cloud – I wont use it. Simple. Every business i know that uses it uses the self hosted version and for very strong reasons would not be interested in moving to cloud. I totally agree with your post. If it weren’t for third party modules aC would never be where it is now. Their approach is that they always know what is best for their customers, which is nonsense – like they have insight into thousands of businesses that are using their tool. And also moving the forums to social media – great, now I’ll have to unblock those sites and mix personal and business. If they move to cloud only we won’t use it. Like the others, our law firm (and most bar associations) requires cloud specification that impact performance – so we are out, as well. Thanks to everyone who took the time to read, and especially to comment here and fill out the survey. I believe it will make a difference in the future of activeCollab, we believe in this community and appreciate everyone who’s contributed in whatever way they can to making it a better community. Keep the comments coming and I know a lot of the sentiments are are that the self-hosted version is crucial, they’ve shared openly that the self-hosted version isn’t going anywhere the question is really will customization and 3rd party modules be part of that offering going forward. We hope it will and as others have said here, we feel it’s an important part of enabling a wide range of businesses and organizations to adapt activeCollab to their needs — there’s nothing quite like AC in this way, giving you the flexibility to do just about anything to make it a better fit for your workflow. We’ve been proud to be a part of that for business around the world, and hope to continue that for years to come. If activeCollab went cloud only then we would move away from AC. One of our original reasons for choosing AC was the self-hosting. We want to be in control of our data and our hosting platform. Furthermore, I think it’s the 3rd Party modules that actually make AC worth using and committing to. Do AC care about self hosted users and 3rd party module developers? Is now the time to start looking at alternatives?